Tyco's Retail Experience Centers are an ideal venue to interact with subject experts and view technology solutions that help empower informed decision-making for more desirable results. 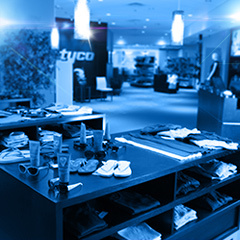 Whether your objective is to minimize shrink, increase conversion rates, optimize inventory levels, drive employee productivity, or enhance overall store performance, Tyco can show you how to leverage the latest technology to deliver retail performance excellence. Download as PDF Tyco's Retail Experience Centers offer access to extensive world-class resources. These briefings promote an exchange of ideas and insights that can drive value for your business. Our subject matter experts share real-world experiences, best practices and effective strategies to help your business become more profitable and competitive in the market. 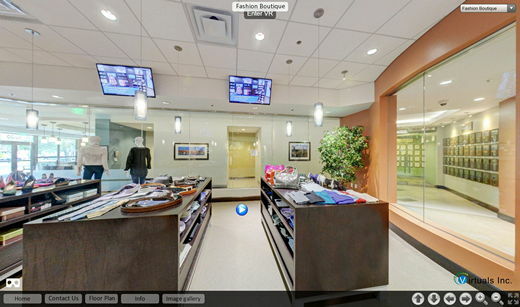 Click over to our interactive site that allows visitors to learn and engage with multimedia content about the complete retail portfolio in 360° panoramic VR. Retail Experience Centers allow visitors to experience the value of our Sensormatic, TrueVUE and American Dynamics brand solutions firsthand in a simulated retail environment. You can see and test the latest hardware and software loss prevention and store performance solutions – to experience a day in the life of your store. located in its Boca Raton, Florida facility. During your visit, we present our integrated solutions and leading edge innovations using a wide array of products, including apparel from top fashion retailers; hardgoods; merchandise from grocery; Do It Yourself (DIY); and electronics retailers. Live demos are conducted to showcase our integrated solutions – covering store zones such as the front, point-of-sale, fitting room, and back room – for a total store experience. Also you can experience our unique Sensormatic kiosk, an interactive journey through the retail environment to help you learn more about Tyco’s expanded, broad portfolio of Sensormatic anti-theft hard tags, alarming wraps and safers solutions.